Petungsewu Village, Wagir District, Malang Regency is one of the villages where most of the people are incensed craftsmen, but the incense produced is semi-finished incense or raw incense. The problem faced by incense craftsmen is that the selling price of semi-finished incense tends to decline from year to year, the limited bamboo raw material even has to be imported from other areas, only producing semi-finished incense (raw). The aim of the activity is to increase the value added of incense products and increase people's income by selling incense products with brand packaging. The method of implementing the activity is to diversify the product by training and mentoring in making incense, product packaging training and quality control, online marketing training, utilizing incense making technology. As a result of community service activities, the community is able to produce fragrant incense packaged and branded and has been sold. Besides that, by utilizing incense bamboo making technology, the production capacity of incense biting production increased, the quality of the bamboo produced was more uniform, so the problem of limited incense material could be overcome. Badan Pusat Statitik Indonesia, http://bps.go.id diakses Desember 2017. Glendoh, Sentor Harman, (2001). Pembinaan dan Pengembangan Usaha Kecil, Jurnal Manajemen & Kewirausahaan. Vol. 3 No. 1. p. 1-13. Jansen, B.J. (2006). The Comparative Effectiveness of Sponsored and Nonsponsored Links for Web E-commerce Queries. ACM Transactions on the Web, Vol. 1, No. 1, May 2006. Jinling, Chang et all. (2009). Modeling E-Commerce Website Quality with Quality Function Deployment, IEEE International Conference on Deployment e-Business Engineering. 21-23 Oct.
Sarwoko, E., Surachman, and Armanu, (2012). Entrepreneurial Characteristics and Competency as Determinants of Business Performance in SMEs. IOSR Journal of Business and Management, Vol. 7 Issue 3. Supardi, Julian. (2009). Rancang Bangun Collaborative System Pemasaran Hotel Secaraon-line Dengan Pendekatan Mediator based. Jurnal Sistem Informasi Fasilkom Unsri. Vol 1 No 2. SARWOKO, Endi et al. Peningkatan Nilai Tambah Pengrajin Dupa Desa Petungsewu Kecamatan Wagir Kabupaten Malang. 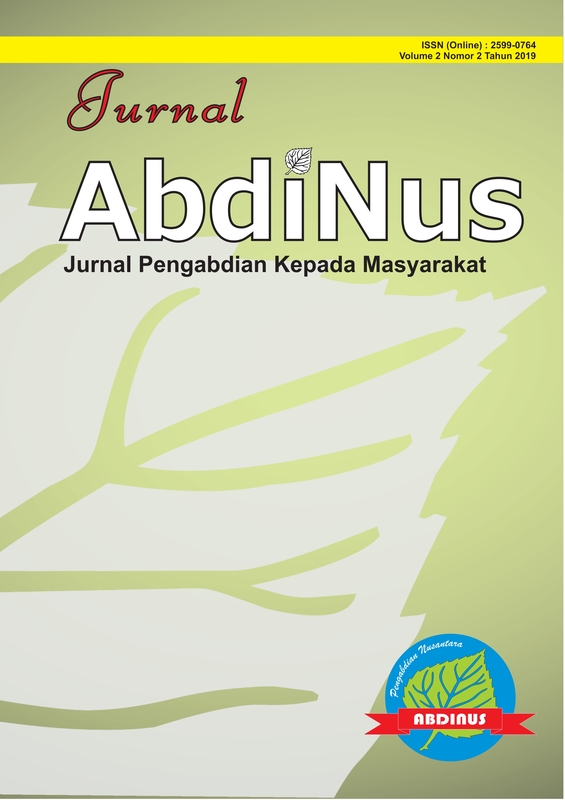 Jurnal ABDINUS : Jurnal Pengabdian Nusantara, [S.l. ], v. 2, n. 2, p. 129-142, jan. 2019. ISSN 2599-0764. Available at: <http://ojs.unpkediri.ac.id/index.php/PPM/article/view/12575>. Date accessed: 24 apr. 2019. doi: https://doi.org/10.29407/ja.v2i2.12575.